LOUDON, N.H. – To Denny Hamlin, it was just hard short-track racing for the win. 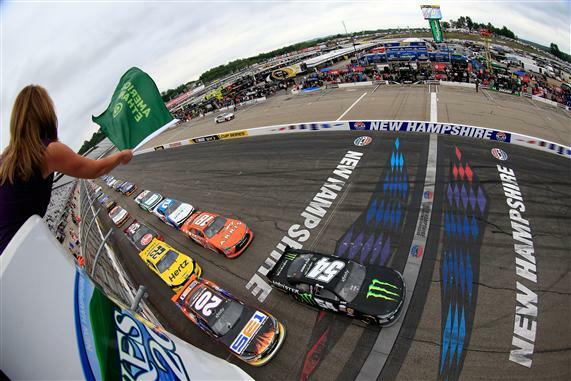 To runner-up Austin Dillon, it was unnecessarily aggressive driving that led to Hamlin’s victory in the Lakes Region 200 NASCAR XFINITY Series race on Saturday at New Hampshire Motor Speedway. On Lap 179 of 200 at the Magic Mile, Hamlin drove his No. 20 Joe Gibbs Racing Toyota to the inside of Dillon’s No. 33 Chevrolet. Hamlin slid up the track into Dillon, broke the No. 33’s momentum and took the lead. Eventual third- and fourth-place finishers Brad Keselowski and Kyle Busch also passed Dillon, who later regained the positions he lost to Keselowski and Busch but ran out of time in his pursuit of Hamlin. Earlier in the race Hamlin had two similar incidents with Busch, his teammate. And though Busch didn’t appear particularly annoyed with Hamlin’s tactics, Dillon was incensed. Hamlin wrote off the contact to all-out racing at a one-mile flat track. In Hamlin’s view, Dillon wasn’t blameless either. “Well, he jumped the restart, for one,” Hamlin said. “I’m the control car, but that’s fine. Eventually I was going to get back around him anyway. Same thing—I was a fender ahead, and he drove in there knowing that he was going to have to hold me low to hold the position, and I just washed up into him. Dillon clearly had a different opinion. “What is racing, if you can’t race side-by-side for more than a corner?” Dillon asked rhetorically. “He never even went through a corner with me, the whole race. He didn’t want to. He just moved me. Missed the corner. Wrecked me. Dillon indicated there might be some payback in the offing but wouldn’t reveal how or when. Dillon got the lead on Lap 175 moments after a restart following the sixth and final caution for Brian Scott’s blown engine. Both Hamlin and Dillon had stayed out on old tires under the previous yellow, but Keselowski came to pit road for fresh rubber on Lap 142. As it turned out, the new tires made little difference. Rookie Daniel Suarez ran fifth, followed by Ty Dillon, Regan Smith, Darrell Wallace Jr., Chase Elliott and Brennan Poole. Series leader Chris Buescher finished 14th, one lap down, and saw his lead in the standings shrink to 31 points over second-place Elliott. 1. (1) Denny Hamlin(i), Toyota, 200, $52101. 2. (6) Austin Dillon(i), Chevrolet, 200, $32261. 3. (4) Brad Keselowski(i), Ford, 200, $27038. 4. (2) Kyle Busch(i), Toyota, 200, $26186. 5. (3) Daniel Suarez #, Toyota, 200, $27768. 6. (7) Ty Dillon, Chevrolet, 200, $23909. 7. (8) Regan Smith, Chevrolet, 200, $23253. 8. (11) Darrell Wallace Jr. #, Ford, 200, $24948. 9. (9) Chase Elliott, Chevrolet, 200, $23720. 10. (13) Brennan Poole, Chevrolet, 200, $23494. 11. (10) Brendan Gaughan, Chevrolet, 200, $22467. 12. (14) Ben Rhodes, Chevrolet, 199, $22341. 13. (21) Ryan Reed, Ford, 199, $22188. 14. (20) Chris Buescher, Ford, 199, $21935. 15. (19) JJ Yeley, Toyota, 199, $22209. 16. (15) Dakoda Armstrong, Ford, 199, $21681. 17. (17) Elliott Sadler, Ford, 199, $21755. 18. (28) Eric McClure, Toyota, 198, $21402. 19. (23) Jeremy Clements, Chevrolet, 198, $21352. 20. (16) Blake Koch, Toyota, 198, $21802. 21. (25) Cale Conley #, Toyota, 198, $21200. 22. (24) David Starr, Toyota, 198, $21144. 23. (18) Landon Cassill, Chevrolet, 198, $21093. 24. (26) Dylan Lupton, Chevrolet, 198, $21028. 25. (27) BJ McLeod(i), Chevrolet, 197, $21142. 26. (31) Peyton Sellers #, Chevrolet, 195, $20957. 27. (36) Derek White, Dodge, 195, $20921. 28. (33) Joey Gase, Chevrolet, Clutch, 174, $20885. 29. (5) Brian Scott, Chevrolet, Engine, 165, $20850. 30. (35) Todd Peck(i), Chevrolet, Fuel Pump, 156, $21115. 31. (37) Mike Harmon, Dodge, Brakes, 111, $20779. 32. (38) Derrike Cope, Chevrolet, Brakes, 98, $14744. 33. (29) Matt Wallace, Toyota, Vibration, 84, $14723. 34. (12) Ryan Sieg, Chevrolet, Brakes, 46, $20703. 35. (40) Matt Frahm, Chevrolet, Brakes, 42, $14651. 36. (34) Morgan Shepherd, Chevrolet, Brakes, 40, $13234. 37. (22) Ross Chastain #, Chevrolet, Accident, 36, $18234. 38. (39) Josh Reaume #, Dodge, Brakes, 24, $11234. 39. (32) Harrison Rhodes #, Chevrolet, Engine, 16, $16234. 40. (30) Jeff Green, Toyota, Vibration, 3, $9234. Average Speed of Race Winner: 98.342 mph. Time of Race: 02 Hrs, 09 Mins, 06 Secs. Margin of Victory: 0.516 Seconds. Caution Flags: 6 for 38 laps. Lap Leaders: D. Hamlin(i) 0; K. Busch(i) 1-22; B. Keselowski(i) 23-39; D. Lupton 40-42; D. Hamlin(i) 43-44; K. Busch(i) 45-47; D. Hamlin(i) 48-119; B. Scott 120-121; A. Dillon(i) 122-123; D. Wallace Jr. # 124; D. Hamlin(i) 125-173; A. Dillon(i) 174-178; D. Hamlin(i) 179-200. Leaders Summary (Driver, Times Lead, Laps Led): D. Hamlin(i) 4 times for 145 laps; K. Busch(i) 2 times for 25 laps; B. Keselowski(i) 1 time for 17 laps; A. Dillon(i) 2 times for 7 laps; D. Lupton 1 time for 3 laps; B. Scott 1 time for 2 laps; D. Wallace Jr. # 1 time for 1 lap. Top 10 in Points: C. Buescher – 623; C. Elliott – 592; T. Dillon – 585; R. Smith – 564; E. Sadler – 555; D. Wallace Jr. # – 547; D. Suarez # – 516; B. Gaughan – 506; R. Reed – 502; B. Scott – 494. I WOULD NOT PAY A NICKLE TO WATCH AN INFINITY RACE. JOE GIBBS AND OTHER CUP TEAMS THAT FIELD CARS FOR CUP DRIVERS SHOULD BE ASHAMED THAT THEY BRING THEIR TOP DOLLAR TEAMS INTO A LOWER DIVISION AND TAKE THE MONEY FROM THE LOWER BUDGET TEAMS, LET THE REGULAR INFINITY DRIVERS WIN AND TAKE THE TOP PRIZE MONEY. IF A DRIVER MAKES IT TO THE SPRINT CUP LEVEL THEN WHY SHOULD HE RUN IN THE LOWER DIVISION ?